Ashley Iles has worked closely with Ray Gonzales - a world class carver - and the result is the Gonzales hooked skew tools. The difference with these tools compared to conventional skew tools is the shape of the head; a curved edge with cut away from toe and heel (upper and lower point) of the skew so you can access work more easily. Whilst these are not a recent introduction we have sat back a bit and watched how these have been received. Let's face it - some tools introduced during a financial year by some manufacturers are like fisherman's flies, which are more likely to attract the fisherman than the fish. Some people have said the lure of the "shinies" are strong; this is not necessarily a reflection on the quality, it is just that some items don't live up to their expectations. 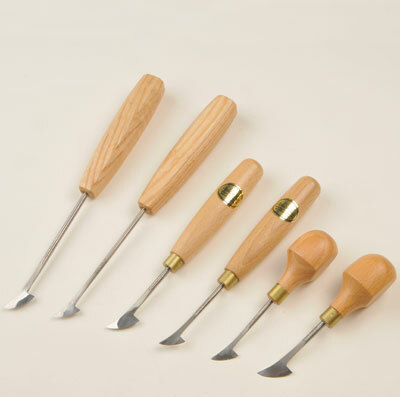 Since these tools were introduced a while back, we have been receiving many comments from people saying how good they are, and a flurry of interest in the normally sedate world of carving. Ashley Iles is known for producing quality tools and these tools are no different. When speaking to the manufacturers, I was told this tool is a 'toad' to make. Well, the head form certainly indicates it is likely to be. Available in two head sizes: 15mm (5/8in) and 19mm (3/4in) and two short lengths of blade, one with a palm-grip type handle and the other with a conventional cigar type. There is also a longer bladed form with a handle that is more akin to a cigar shape with squared-off sides - this allows you to pick and choose according to the work being created, and also to your preferred tool handle and reach. The unconventional head means that this is a multi-function tool. It can be used to pare work down, using the edge at various angles to access work and to create the perfect slicing cut. You can also use the points to incise and use the slicing cut as you work around eyes; for hair and veins on leaves it is very clean and precise. To sharpen, it was simply a case of pulling over a leather stop, remembering to rock the tool slightly from side to side in order to sharpen the full-arced cutting edge. Do not be tempted to re-grind these with a grinder. The tools perform wonderfully. A fantastic edge is achieved by stropping, and the shape of the cutting edge is a delight. It therefore allows myriad options of how to approach work. They are well worth a look and I even found them useful on small-scale work. "A fantastic edge is achieved by stropping"